Apple's latest iPad drew die-hard fans to stores in the U.S. and nine other countries Friday, many of whom lined up for hours to be among the first to buy one. The third version of the iPad went on sale at 8 a.m. local time, with 25 other countries getting it a week later. The new model, starting at $499 in the U.S., comes with a faster processor, a much sharper screen and an improved camera. 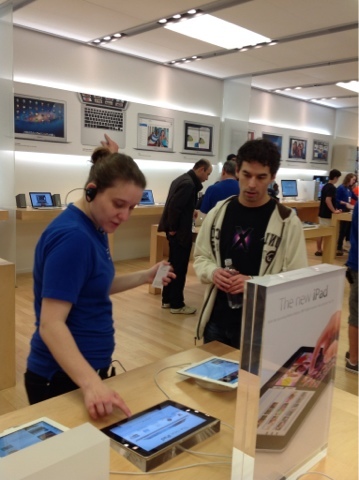 They also made the iPad available in more partner retail shops on the same day. The changes are are huge upgrades from the original iPad, but not so much from the iPad 2. About 50 people lined up outside Apple's store in the Twelve Oaks mall in Novi, Mi. This is about 1950 people less than the number that lined up outside the same store a year ago for the release of the iPad 2. People may think that Apple is not selling as many because the line sizes are small at some stores, but that won't be the case. The earlier opening time affects the size of the line and the need to not have lines in many cases. People can trickle in all day instead of all showing up to a big line at a later time in the day. Apple has made some great changes. Apple changed quite a bit this year with this device. The first change was to remove the number from the IPad naming convention. I reported earlier that I believed they would also change the way the stores handled the opening for sales of the iPad. Instead of closing down the store until 4 p.m. and restricting all sales except iPads, I hoped they would just open the store for business as usual. I almost guessed it right. They did what I thought except they just opened two hours earlier. They did away with black curtain dropping and the gang of Apple employees clapping and cheering. One Apple employee, I spoke with, openly admitted he would miss the old way of opening the store. He had been at the store since 5:30 a.m. Some people had chairs outside the store. People were prohibit from standing outside the mall until 6:30 a.m. on Friday. Once people were let into to the mall, very few brought their chairs. Most people just stood or sat on the floor. Many had other Apple products with them; some laptops, iPads and iPhones. A few played games on older iPads. I spoke with Al from Brighton, MI.who seemed a little embarrassed that he was standing in line for an Apple product (I guess this is a side effect of the Samsung's Anti-Apple commercials). "I usually don't do this! ", he started. "I bought my wife the iPad 2 and tried to get my new iPad online but the ship dates are 2-3 weeks now." It was 7:20 a.m. and the store was scheduled to open at 8 a.m. I explained to Al that his wait would have been much longer and he would have had hundreds of people both in front and behind him during the prior iPad launches. He was thankful that today was different. 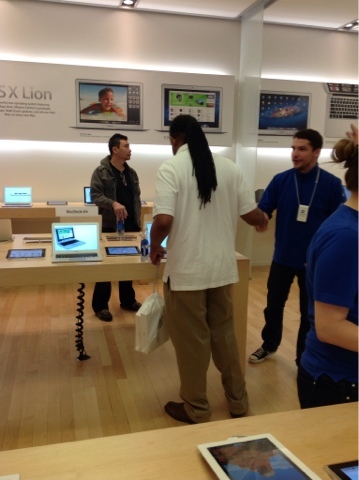 For other customers, standing in line was the only way they would get a new iPad on Friday. Apple quickly ran out of their pre-order supply it set aside for advance orders. Others in line were veterans who wouldn't buy an Apple product without the line waiting. I believe the new changes at Apple will make their company less and less in the coming years. Despite the lower numbers at a time, Apple store employees still bought out water and snacks like they did when the line was much bigger and snaked through the mall. The Apple employees also handed out cards that indicated which iPad (or iPads) you wanted to buy. This card would hold that unit until the end of the day. Al chose the 32GB iPad from AT&T. He was a little bummed to hear that AT&T hadn't decided if or when they would offer Hot spot tethering services on their 4G iPads. At 7:40 a.m. a loud series of shorting erupted from the front of the line. Apparently they would start letting people in prior to the 8:00 a.m. time slot. I am not sure if a customer or Apple employee initiated the cheers; someone obviously don't want to let go of the old way of doing things. The front of the line consisted of those who had pre-ordered their iPad; presumably via the Apple store app for iOS device. We were all in the store by 8:00 a.m. and everyone was processed by 8:12 a.m. Here is a quick look at the new iPad. I used a new iPad to film this video. Many others had walked in and was serviced in the time I spent monkeying around with the display units. I didn't get my unit today, but I look to do so very soon. I played with the iPad for quite some time and the display is gorgeous and vivid. I can't say it better and agree with Walt Mossberg when he stated, "Using the new display is like getting a new eyeglasses prescription—you suddenly realize what you thought looked sharp before wasn't nearly as sharp as it could be." The unit is very snappy and did thing much faster than my original model.I created videos with iMovie and uploaded them to Youtube in a fraction of the time it would have taken on my device. The device seemed to stay warm as I handled it, but I attribute that to the hot bright light shining on the store display units. Despite competition from cheaper tablet computers such as Amazon.com Inc.'s Kindle Fire, the iPad remains the most popular tablet computer. Apple Inc. has sold more than 55 million iPads since its debut in 2010. Apple is going to see a few million this weekend for sure, but I think they will do well over a million in the first day alone. I can't wait to get mine.